Tix: $12 advance, $15 door. Advance tix at eventbrite.com. Facebook Event. Press Release. Download Tour Poster. Tix: $15 general, $10 senior/disabled/student. No one turned away for lack of funds. Info and reservations: 510-549-3864 or email info@trinitychamberconcerts.com. 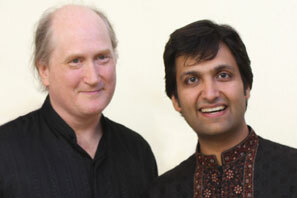 Strains of flamenco, ancient Celtic music, and Indian raga will emanate from this improvisatory duet featuring world guitar pioneer Matthew Montfort accompanied by renowned Indian tabla virtuoso Vishal Nagar. 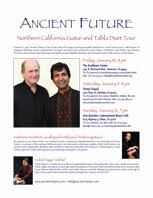 The program will feature music from the ground breaking world music recordings of Ancient Future along with serenades from Matthew Montfort's solo guitar releases: Seven Serenades for Scalloped Fretboard Guitar and Sympathetic Serenade, for which he was lauded as one of the world's 100 Greatest Acoustic Guitarists by DigitalDreamDoor. Montfort is a pioneer among guitarists who have had their fretboards scalloped in order to play various forms of world music that require intricate note-bending ornaments while still being able to play chords. Montfort immersed himself in an intensive study with vina master K.S. Subramanian in order to fully apply the South Indian gamaka (note-bending) techniques to the guitar. Vishal Nagar is considered one of the most gifted tabla players of his generation. Born into a family of musicians, Vishal has been surrounded by music in an extremely musically creative and artistic environment. Vishal had his initial training for a very brief period with the late Ustad Latif Ahmed Khan of the Delhi Gharana. After his Ustad's untimely demise, Vishal continued his training under the guidance of Ustad Shamim Ahmed Khan. He also has had intense rhythmic training from his mother, the renowned and highly respected Kathak dancer and vocalist, Urmila Nagar. The Trinity Chamber Concerts show will feature special guest Mariah Parker on santur, and the Don Quixote's International Music Hall concert will feature special guest Shenshen Zhang on pipa. Both are featured in the new video releases below. This video captures the very first time that Chinese pipa master Shenshen Zhang and scalloped fretboard guitar pioneer Matthew Montfort played together. 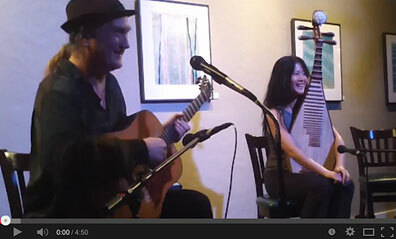 They met on August 21, 2011, at an acoustic guitar concert set up by steel string guitarist Mike Kostowskyj with Matthew Montfort on scalloped fretboard guitar and Richard Patterson on classical guitar at The Wine Bar in Half Moon Bay. Mike invited Shenshen Zhang to perform a number by herself. Matthew invited her to jam with him, and this is exactly what happened from their first note together! The unedited video was recorded by Mariah Parker from the audience. Shenshen Zhang will be sitting in with Matthew Montfort and Vishal Nagar at Don Quixote's International Music Hall in Felton on January 12. 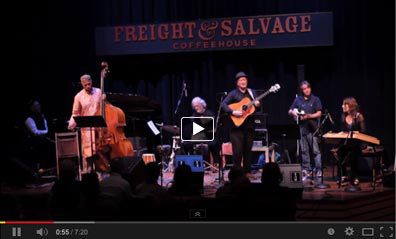 Recorded on October 16, 2013, at the Ancient Future 'World Without Walls' Reunion Concert at the Freight and Salvage in Berkeley, California. This is a medley of "Prelude" by Matthew Montfort and "Bookenka (The Adventurer) by Doug McKeehan from Ancient Future's "Asian Fusion" release. It features Doug McKeehan on piano, Kash Killion on bass, Ian Dogole on percussion, Matthew Montfort on scalloped fretboard guitar, Jim Hurley on electric violin, and Mariah Parker on hammered dulcimer, who will be sitting in with Matthew Montfort and Vishal Nagar at the Trinity Chapel in Berkeley on January 11. This video just surfaced of the late flamenco guitarist David Easley performing at the Flamenco Society Juerga on June 24, 1995. David Easley had a profound effect on the early development of Ancient Future. He cornered Matthew Montfort in the hall at Boulder High School to request lessons, starting with 'Mood for a Day' by Steve Howe. David couldn't play the first chord, which was a barre chord, so Matthew tried to dissuade him. But he persisted, asking Matthew to just show him how to play a barre chord. He soon mastered it, and cornered Matthew every day asking for the next section. Within a month, he could play the entire piece! As the lessons progressed, David became an amazing guitarist, and began to perform with Matthew in the local acoustic music venues. David took an extensive study trip to Spain, and when he returned, he repaid Matthew for his mentorship by teaching him authentic flamenco forms and techniques. This was one of Matthew's first steps in his studies of world music traditions. The circumstances of David Easley's passing are still a mystery, and before this video surfaced there were no known recordings of him. At least he left behind this masterful performance. Matthew Montfort and Vishal Nagar were interviewed by Jane Heaven on Sunday Night Live on KPFA on December 29. The webcast archive is available for streaming through January 12. It features the radio debut of two new studio recordings of the Ancient Future Guitar and Tabla Duet that will soon be added to the Archive of Future Ancient Recordings. On Sunday, January 5, at 2 pm, Matthew Montfort will be interviewed by David Sharp on his Crossing Borders show on KRCB 91.1 FM, Santa Rosa. It will stream live at krcb.org/on-krcb-radio-91 and on Comcast channel 961. This sale is being extended until February 11, the exact 35th anniversary of the first Ancient Future concert. Act now as this is the very last chance to purchase these releases at these prices! Sangria by Mariah Parker. Ancient-Future.Com Records AF-2017. List $17.98. Sale: $10. Buy 1 Now. (>YTmusic). Seven Serenades for Scalloped Fretboard Guitar by Matthew Montfort. Ancient-Future.Com Records AF-2008. List $17.98. Sale: $10. Buy 1 Now. (>YTmusic). Sympathetic Serenade by Matthew Montfort. Ancient-Future.Com Records AF-2012. Signed EP CD-R. List $12.98. Sale: $10. Buy 1 Now. (>YTmusic). Ancient Traditions–Future Possibilities by Matthew Montfort. Book/Enhanced CD set with MIDI Soundfiles. List $69.95. Sale: $52.95. Add optional Skype lesson for $50 ($60 List). Buy 1 Now.